Our first board was based on an Atmel ATmega328 chip and the board was designed to accomodate the a ITG3200/ADXL345 Accelerometer/Gyro breakout board from Sparkfun. This first version used the MultiWii software. We have since moved on to using the Aeroquad software which we find to be much more stable and has many extra features. The ATmega328 board was sadly no longer up to the job and required a microcontroller with more memory. 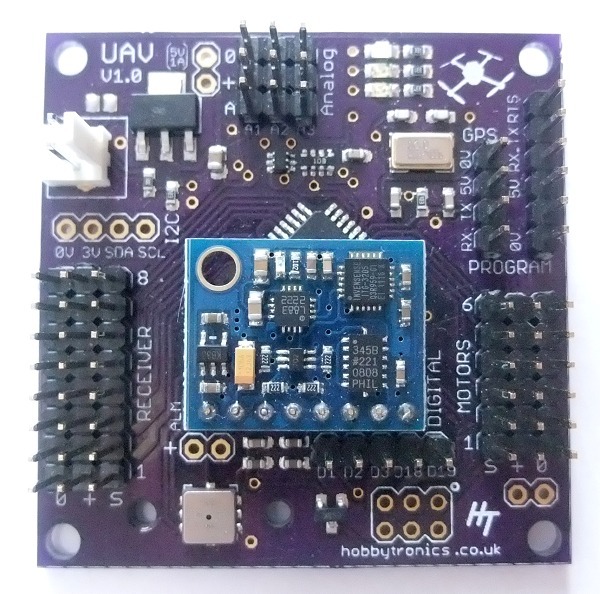 The Aeroquad software was originally designed to run on an Arduino Mega board with a shield which gave all the connections to the Radio Control receiver, speed controllers etc.